Gutti Kakarakaya recipe with step by step photos.I have mentioned many times before that Bitter gourd is a favorite vegetable to TH and it is a norm to make a bitter gourd variety in any form atleast in one meal over the weekend.He likes the simple preparations like bitter gourd fry, bitter gourd onion curry where as I prefer to eat the stuffed versions as the bitterness can be balanced in the stuffed version. 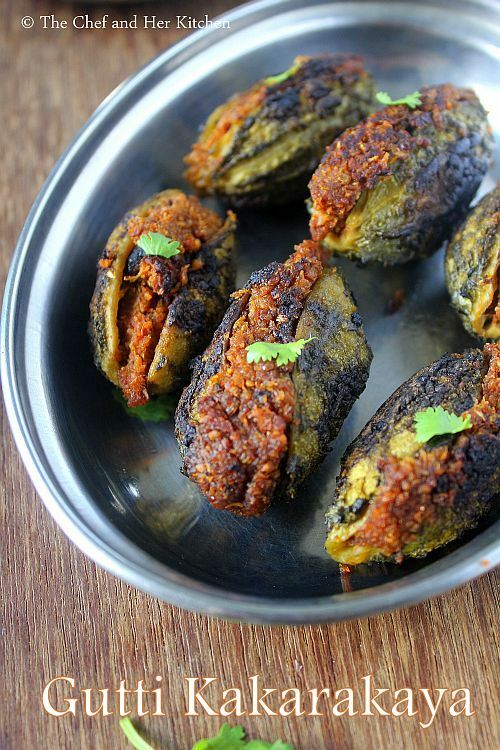 I had already posted a couple of stuffed bitter gourd recipes like Stuffed Karela with Besan, Stuffed Karela with Onion and today I am posting another version which is my mom's signature recipe. Though I was never a fan of bitter gourd but always love my mom's Kakarakaya Podi and her version of stuffed bitter gourd which she fondly calls as 'Kakarakaya Biscuit'. I don't know why she gave it that name but even I got used to call this version as Kakarakaya biscuit.My mom's Kakarakaya podi is always a hit among my family and friends,whoever has tried it till date they just loved it and asked for extra helpings, it accompanies in my lunch quite often. Wash and trim the edges of the bitter gourds,peel them and make a cut vertically keeping the edges intact and scoop out the seeds.Peeling the skin is optional. Apply salt all over the bitter gourds inside and outside and leave it for 1-2 hours.You can even par boil them in tamarind water for 5-6 mins.Both the methods reduce the bitterness. Dry roast chana dal,urad dal along with cinnamon and cloves until the dals turn slightly red in color,remove them. 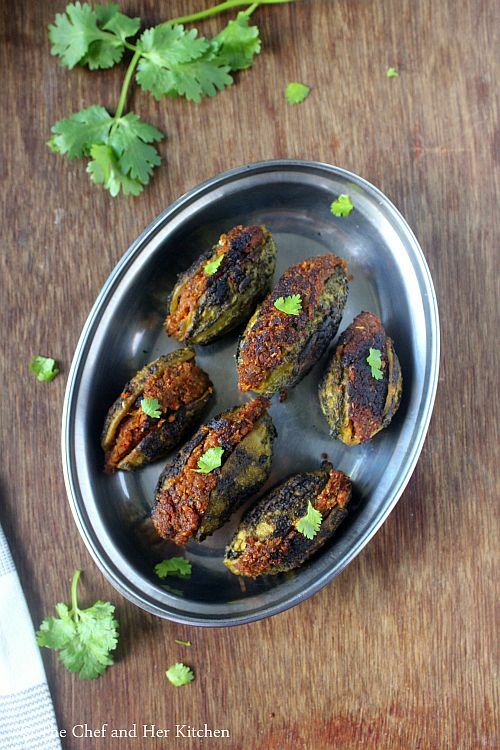 In the same pan add dry coconut,sliced onion and garlic pods and fry for a couple of minutes.Cool them. 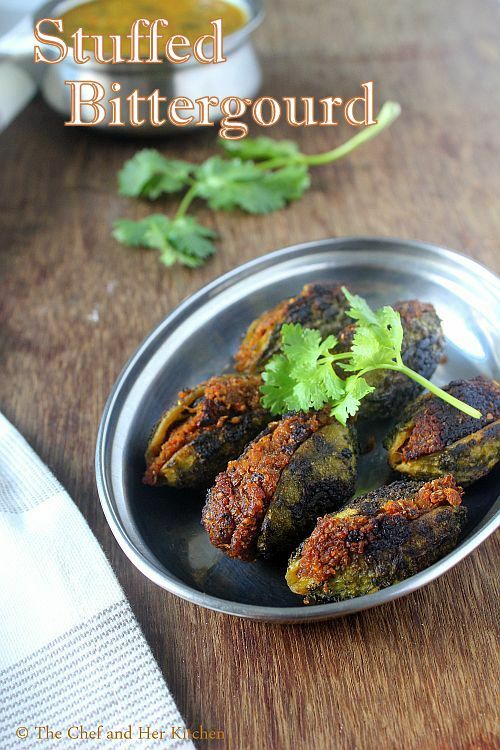 Grind raw coriander seeds with the roasted dals, red chili powder, turmeric powder to a coarse powder. Add the roasted coconut,onion,garlic and tamarind pulp and jaggery and grind to a paste. Heat 1 tbsp oil and add the ground paste and fry nicely until the mixture is dry and starts leaving the oil at the edges. Stuff the slit bitter gourds with this mixture. Heat a wide pan and add 2 tbsp oil and place the bitter gourds with the stuffed side down and let them cook over low-medium flame until they are brown and roasted on all the sides.Keep turning them in between for even roasting. 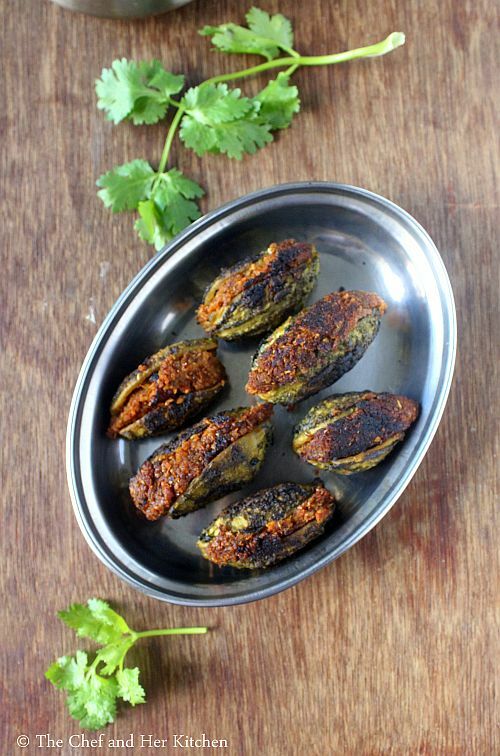 Serve it hot with hot steamed rice.You can mix it with rice or eat as a side dish with dal/sambar/rasam. 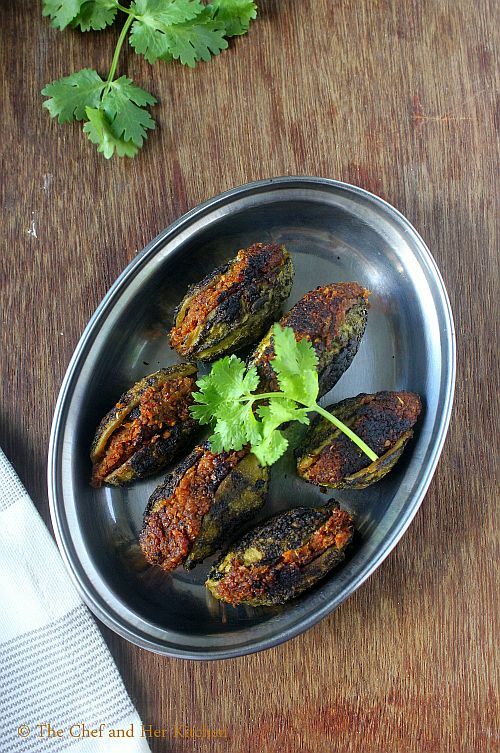 You can stuff the fried mixture in small brinjals to make gutti vankaya or blanched dondakaya(tindora) to make gutti dondakaya or in ridge gourd roundels to make gutti beerakaya.All the versions taste yumm. I did not have dry coconut at that moment and hence I used grated fresh coconut.